Yesterday I attempted to discuss this wiggly topic of how GID is not lockstep. In GID, our job is to guide students to find their own direction for inquiry in this fluid flexible process. So, what are some key concepts that you can keep in mind as you try to follow the students and stay true to the process. Being flexible takes deep understanding of the process. In order to deviate from the norm, we have to fully understand the norm, first. So knowing the process deeply from a theoretical standpoint and a practical “in the classroom” view helps us to be confident in our variations from that norm, to know what is in bounds and out of bounds. With that knowledge, we can balance trusting the phases of the process, with following the students as we get to know our students in the process. s you to know when we are ready to move on. The bullet points for each phase are a great checklist for you. The more practice you have guiding the process with students, the more you know how it feels, how students interact, and what they need from you at each phase. The more you understand the research behind GID, the more fluid and flexible you can become, in the moment. 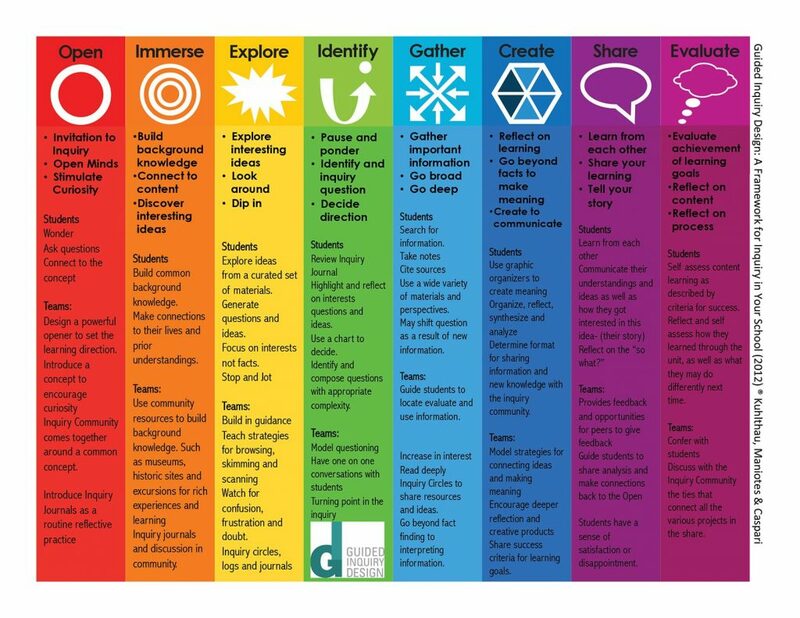 Here’s a link to some of the core research on the ISP – remember it is a user-centered design, meaning it came out of a need to better the experience for students who were learning through information in school. It doesn’t come from another industry, but is focused in education and on student learning. Too much adherence to the plan, you’ll get concrete – and less learning. Inquiry learning requires us to Listen to our students, where they are struggling, where they are becoming inspired, in what direction they are leaning, will help you to “go with the flow” within the process. read their journals with an open mind and heart. The results of those observations and interactions takes the form of shifting and differentiating conversations, groupings, lessons, and directions as needed by students. That’s how we become flexible within the model, by paying attention to how our students are engaging. The Inquiry Tools inform you of students’ needs. The example I described yesterday shows when you put in the work at each phase, you can be confident of your forward motion. 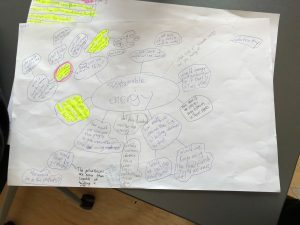 In this case, the students had spent ample time in Open and Immerse and at the end of Explore they each had detailed their own individual ideas for the direction of their research all mapped out. Proper use of the Inquiry Tools will help to guide you and the process in flexible forward motion. Continually reflect on the work. Conversations with your colleagues, coaches, and teammates can also help you to think through where you are and what students might need as compared to what was originally planned. Just going through the motions of your plans won’t help you to be flexible within the model, that might even solidify the flexible process into a lock step (concrete) approach. But reflecting on each phase, how the students engaged, and the intention of each phase can drive your flexibility within the process. With that, I invite you to join us with your reflection here on this blog. That’s what this blog is for. It’s for you to have a space to reflect within our community and with my support! Because Guided Inquiry is better through reflective practice we created this space for you to practice, try and reflect. Here we are not looking for perfection, but an inquiry stance, that you’ve tried something and are learning from each attempt! Through you we can all learn and improve. Thanks for reading and I hope you’ll give it a go. The definition of Guided Inquiry Design states that it is “a fluid flexible model” (2012, p. xiii). 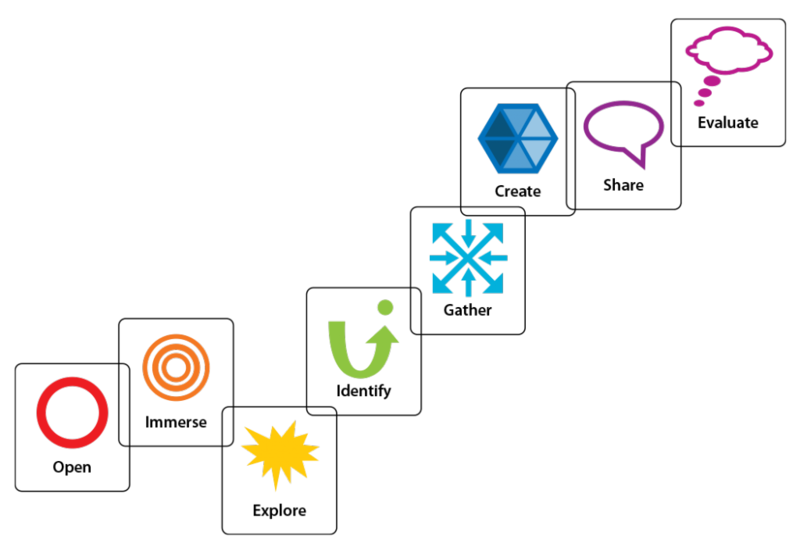 But it is presented as 8 distinct phases. So what’s flexible about it? Shouldn’t you always go through those phases? Well, the answer is, yes, BUT…. Within the GID process, we have to allow students room to make it their own. We have to find that balance between going through the phases and creating their own meaning. We need to keep it natural, yet blend in protocols that support student thinking and perseverance. This is the challenge of the inquiry guide. This challenge is not static with an easy one-time answer, as it will shift with each new group in front of you. But, what we can think about are some concepts that guide our actions. In Kuhlthau’s research (2004) some students weren’t successful at getting a focus. They just thought they could gather information and “smush it all together.” As a result they had a more difficult time with the latter phases of the process and in the end weren’t very satisfied with the results. One of the reasons we created Guided Inquiry Design was so that teachers and librarians wouldn’t find students floundering through the process with no direction. We wanted all students to use the process to create meaning for themselves and learn about themselves as a learner. 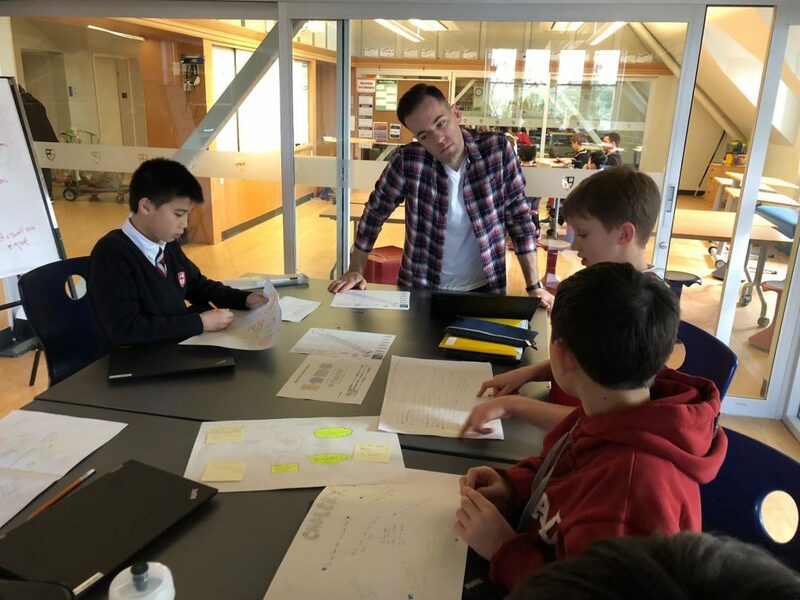 While visiting and coaching teams at Saint George’s School in British Columbia, the grade six team was guiding students to move from the Explore phase to the Identify phase. They were wondering about when to move onto the next phase- are the kids ready to Gather? What if some students are ready and others are not? The hard work the students had put in was evidenced by their Inquiry Charts (mind maps) of questions on a variety of topics. Not only had they created these detailed mind maps in class, but each student had prioritized their most interesting ideas (see photos -highlighted or circled questions). During the session where I observed, the students were meeting with an advisor in Inquiry Circles prearranged by topic. It was all hands on deck for this session. All the students had an opportunity to vet their ideas and talk about the viability of their questions within a small group with the guidance of an advisor. They each shared their prioritized questions with the group and they discussed how the questions could be blended or adjusted, where the holes might be and so forth. After the session, two of the advisors met with me to reflect on the work. Knowing that all students will not identify their question at the same time, makes the Identify phase a logistical challenge. This requires flexibility. We have to teach our students to be flexible too. They want hard fast answers just as much as we want a clear plan. To bask in uncertainty is uneasy. But having a pretty good idea, and some direction, is what we are looking for here. Moving into Gather, we want students to have a clear direction yet feel open to new ideas. Perhaps their question will shift and change a bit through the Gather phase as their information points to new ideas. Naturally their topic will narrow in as they search and seek information. But they have to remain open to new ideas (Our students need to assume an inquiry stance throughout, just as we do!). If students are reflecting on what they are doing all the way along- there is no harm in moving forward knowing that some students may be a little more fuzzy than others about their direction. When you are using the process, embedding the tools, you are providing them with ample opportunity to engage the necessary work to be successful. Moving on, and continuing to check in, will be the best move for all of you, in that case. The decision to between supporting the few to get there and staying until everyone has identified a perfect question and moving on is not an easy one. But when you trust the process, and have set them up for success you can feel easier to move forward. 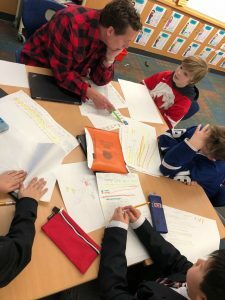 These teachers did move forward even though every question wasn’t perhaps “ideal,” the preparation work that was completed by all the students gave them the time and resources to plan a direction. They had given a lot of thought to where they were going and they had some sense of it. So how do we know if students are on the right track, in the advisory. Well, one teacher in this set of advisors was trying to get to the bottom of why the students wanted to know the things they were asking, what motivated them to find out about the illegal drug trafficking between Mexico and the US? 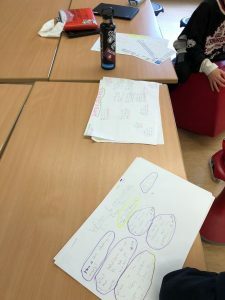 He prompted them to make clearer connections between themselves and their questions. Third Space is critical to having the right question. Curiosity, real questions, and relevance enter into those inquiries that engage the Third Space. So, asking why is this important to you, is a worthwhile prompt. Knowing the resources is also critical (typically in the wheelhouse of the school librarian). When students are asking questions of which there is limited information available, their question will naturally have to shift. This can be addressed at this phase of the inquiry. Or, it can wait until Gather and be sorted out then. But be aware, that students who have difficulty finding information, will need more guidance in the Gather phase as they rethink their direction. These students will need to remain open to new ideas. They’ll also need conversation to assist them in articulating new directions. Some think about this as a mini cycle, at this point, back to Explore– through Identify and on again to Gather (Talk about flexible! Something many of us have learned through using the model is that knowing the purpose of each phase frees us up to recognize when these kinds of cycles are a support or a hinderance. In this case the student may not have accomplished the purpose of Explore, but without forward motion they couldn’t move anywhere, so the cycle back sets purpose to the work and hopefully provides a good outcome). This, of course, will take extra time, but if given the space to do so, when necessary, the end learning result will be much improved over slogging on down a path that was less interesting or fruitful. So, tomorrow I’ll share some key concepts to keep in mind when maintaining that balance between flexibility and sticking with the phases. Thanks to the folks in Grade Six at St George and the Advisory team for allowing me to observe your amazing practice and share it with this community. Together we are stronger- each time I am in Guided Inquiry I learn something. I hope you do too!